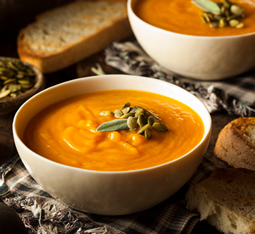 Butternut Squash Soup with Verjus - A recipe from Savor California, the online showcase for extraordinary gourmet foods and beverages from California. Slice the squash lengthwise and scoop out seeds and pulp. Place the two squash halves flesh side down on a greased baking pan. Roast about one hour, until the squash can be easily pierced with a knife. Set aside to cool. Place the onions, garlic, olive oil and 1 cup water in a saucepan and bring to a boil. Reduce to a simmer and cook, stirring occasionally, until the water evaporates. Continue cooking and stirring on low until the onions are translucent. Scrape the flesh from the squash with a large metal spoon. Add squash, chicken stock and Verjus to the onions. Bring to a boil and simmer 20 minutes. Puree in batches in a blender or food processor and pass through a sieve. Add the heavy cream and season to taste with salt and white pepper. Garnish with pepitas, if desired. * Note: If using canned chicken stock, reduce 4 cups unsalted to 2 cups.